Coming in July on DVD from Mill Creek Entertainment is Birdy which originally was released in 1984 by Tristar Pictures. 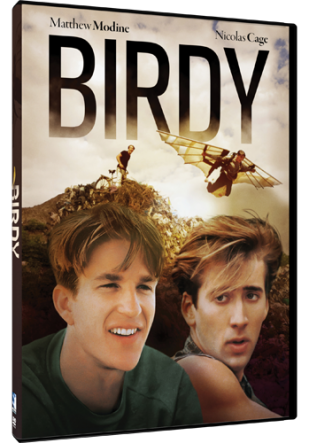 Birdy stars Matthew Modine, Nicholas Cage, John Harkins, Sandy Baron, Karen Young and Bruno Kirby. Birdy is directed by Alan Parker, produced by Alan Marshall with the screen play by Sandy Kroope & Jack Behr. To escape an irrational world, Birdy, a Vietnam veteran, sits in an almost catatonic state in an Army hospital, where he has come to believe he is one of the feathered creatures of his boyhood dreams. In an effort to break Birdy’s silence, his psychiatrist brings in Al Columbato, Bird’s loyal best friend of his youth. Al desperately tries to reach the disturbed Birdy and bring him back to reality. The answer may lie in their youth, where the eccentric Birdy first donned wings and the happy-go-lucky Al helped him to fly. My Opinion: This movie is very interesting as when it came out I was a little young to watch it and this is my first time seeing it so it was all new to me. It had me crying as it is a sensitive subject we all can relate along with having a happy ending.